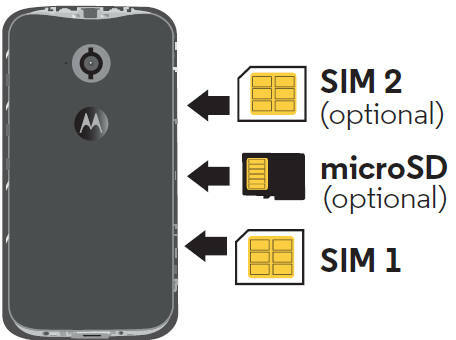 The correct SIM card size for Moto G (including Moto G 2014, and Moto G 2015) and Moto E, and how to insert SIM card into Moto G and Moto E.
SIM card is needed when you want to use Moto G phone capabilities (making calls, receiving calls, sending SMS, receiving SMS) or when you want to use mobile data to access internet. Please note, Moto G (including Moto G 2nd Gen, aka Moto G 2014; Moto G 2015, aka, Moto G 3rd Gen) and Moto E (including Moto E 2nd Gen, aka Moto E 2015) can function normally without a SIM card. Just imagine a lot of WiFi only tablets. What is the correct SIM card size for Moto G, Moto E and Moto X? Full size SIM card. Actually no smartphones in the market are using it now. It has the size of a credit card (85.60 mm *53.98 mm*0.76 mm). Mini SIM card. This is usually refer to as normal SIM card. Some old smartphones are still using Mini SIM card. Its size is 25mm*15mm*0.76mm. Micro SIM card. This has been the mainstream in last one or two years. It is smaller than Mini SIM card (15mm*12mm*0.76mm). Moto G, Moto G 2nd Gen (Moto G 2014), Moto G 2015 (Moto G 3rd Gen), Moto E and Moto E 2nd Gen (Moto E 2015) all use Micro SIM card. However, Moto X and Moto X 2nd Gen (Moto X 2014) use Nano SIM card. Can I cut the SIM card with Mini SIM card or use Nano SIM card with adapter? Although there are many online guides on how to cut Micro SIM card with Mini SIM card, it is NOT recommended to use such cards on Moto G or Moto E. Moto G and Moto E may have problems with the rough cutting/trimming edge. In addition, some old Mini SIM card has larger metal part. If you trim such a card to Micro SIM, the metal part may touch the edge. This will cause unpredictable problems on Moto G and Moto E.
If you have the smaller Nano SIM card, some vendors may suggest you to use an adapter to be used in Moto G or Moto E.
This is also not recommended. Most of such adapters in the market do not have good quality. The dimension, mainly the thickness, is not accurate. This again can cause problems in Moto G and Moto E.
So, you’d better get Micro SIM card for your Moto G and Moto E from your carrier. 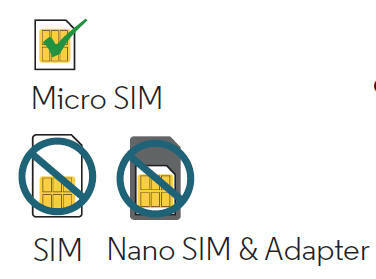 Some carriers actually now offer 3-in-1 SIM card, which can be used as Mini, Micro and Nano SIM card. How to insert SIM card into Moto G and Moto E? To inset SIM card into Moto G and Moto E, please follow these steps. Step 1: Power off phone. You should power off Moto G or Moto E before inserting SIM card into the phone. You can press and hold the power button, then follow the on-screen instructions to power off the phone. Step 2. Remove the Moto G (or E) back cover. 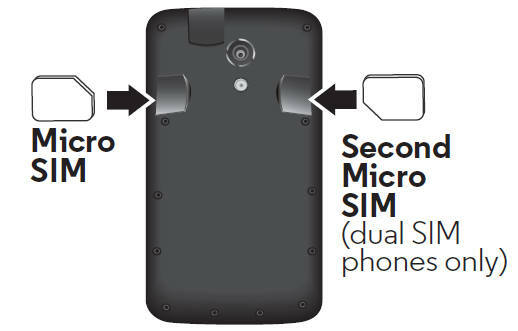 SIM card slots for Moto E, Moto E 2nd Gen and Moto G are under the back cover (please read this page for Moto G layout). So, you must take off the back cover to access the SIM card slot. To remove Moto G back cover (or remove Moto E back cover), please follow this guide. With the gold contacts facing down, push in your SIM card as shown below. The SIM card should click in. If your phone is a dual SIM model, you can insert the second SIM card similarly as shown below. For dual SIM Moto G or Moto E, it is not necessary to insert SIM card to slot 2 if you want to use one SIM card on the phone. For the usage of dual SIM cards, please check this guide. As shown below, with the gold contacts facing up, push in a card. After the SIM card is clicked in, you can put back the cover. Step 5: Power on the phone. Power on the phone to enjoy it. How to remove SIM card from Moto G and Moto E? To remove SIM card from Moto G or Moto E or replace SIM card for the phone, you can follow the similar procedures mentioned above. Step 1: Power off the phone. Step 2: Remove the back cover. To remove a SIM card, push it in to release it. Then you can slide it out. Please do NOT pull it without releasing it. It may damage the SIM card slot. Step 4: Put back the back cover. Can you insert or remove SIM card for Moto G and Moto E? If you have problems or questions to insert SIM card into Moot G or Moto E, or remove it from Moto G or Moto E, please let us know them in the comment box below. Hi, I have a Moto G 3rd Generation, problem I have is it does not recognise any sim card. The sim cards work in other phones, but I can’t get my Moto G to work at all. Any ideas as to how to fix this? Did you place the SIM card in the correct orientation as explained in the Moto G 2015 (3rd Gen) user manual? You can download the PDF user manual here. Is there any phone in Moto family with 3 slots? Nope. Others series only have two slots. One slot is dedicated for SIM card. The other can be used either for SD card or sim card. I bought an unlocked Moto 4G Play in Calif. but I spend most of my time in Mexico. I have a Mexican sim card installed right now. I can call the U.S. on a simple plan from Baja ($200 pesos per mo.). Do you think I will be able to use my pone in Calif. or will I have to put in another sim card from the U.S.? Love my phone!! Whether you can use sim card in another countries is enabled or disabled by your phone company. You need to enable​international roaming through your phone company. It had nothing to do with the phone. But international roaming usually is very expensive. You should check with your phone company on charges. Normally, it’s cheaper to get local SIM card. Hi! My boyfriend just purchased a Moto G+ 5th gen phone. The phone came without a Nano Sim card. He purchased a Nano Sim and plan from Total Wireless. Although the nano sim is the proper size, he cannot insert into his Moto G+. He followed all directions precisely, to no avail. There are side rails on the removable sim tray that prevent insertion. It simply will *not* snap in. I even tried inserting my Verizon nano sim as a test (it is the same size). No dice. Please explain exactly how you get the nano sim into the tray. We are pulling our hair out. For Moto G5 plus, the SIM card tray has two sides, the front (top) has slots fro two SIM cards. You just put nano SIM card in the slot with metal part facing upwards. The back (back of SIM card slot 1) is for micro SD card, you need to put SD card from tray back with metal part facing downwards. Can you find the two SIM card slots? You can share a picture in our Facebook page if you still have problems. Did you buy a dual SIM model or single SIM model? Moto G4 has both single SIM and dual SIM versions. In US, only single SIM version is available. Same problem, extremely disappointed as that was the main reason for purchase. This fact was not on the website. It will be returned. My name is ram. I am using moto e 2 my mobile is unable to show any other sim of same network and when I insert it is showing no sim card. Did you get the Moto E from your phone company? Is it locked? Hi I’m having a problem with my Motorola Moto E 1st Gen. My phone suddenly stopped working about a week ago and I thought it was one of these random reboots but no. When I turned the phone back on it said no sim card. I have never taken the sim card out since I got the phone in December of 2014. I have taken it back to tesco (my provider) but they just said send it away but I could cost up to £90 so I was wondering if anyone else has had this problem and if there is anything I can do because I don’t want to send it away and for them to say it’s a £90 fix. Did you test other sim card on the phone? Did you test the sim card on other phones? Thank you for pointing it out. We just updated the page with pictures for Moto E 2015 SIM card. What’s exactly shown on the screen? What’s SIM status in settings – about phone – status? The orientation of the sim card should match the print on the phone. The metal side in the sim card should face downwards. Anyway, if you are not sure, don’t try. Ask the seller to solve the issue or visit local service center. Consumer Cellular’s SIM cards are compound. The frame that makes the nanoSIM into a MicroSIM is fragile and can break inside the SIM card reader. This has happened to me twice on new MotoG 3rd Gen phones; I never had this problem with my Huawei or Blu phones. Is this just a problem with Motorola phones? Or this an issue only with Consumer Cellular compound SIM cards. Since GSM phones require SIM removal/replacement as first step in trouble-shooting, this is a deal-killer for me. Is there any service provider which uses a one-piece micro SIM? Or is my only option using a CSMA phone? Not sure on this issue. You may just insert the pull out gently. I have a Motorola XT1540, my problem is ,one of the gold thing on the sim card slot which reads the sim card was removed, can it get fix? I think most service center can fix such sim card slot problems easily. As the sim card goes in which side should the cut corner be? The marker near the sim card slot on the phone shows the orientation.